Grammy-nominated New-music icon Ursula Oppens, who commissioned, premiered, and made the first recording of maverick American composer Frederic Rzewski�s The People United Will Never Be Defeated!, a remarkable, monumental set of solo piano variations, has re-recorded that landmark 1975 work with Grammy winning producer Judith Sherman to mark the work�s 40th anniversary. 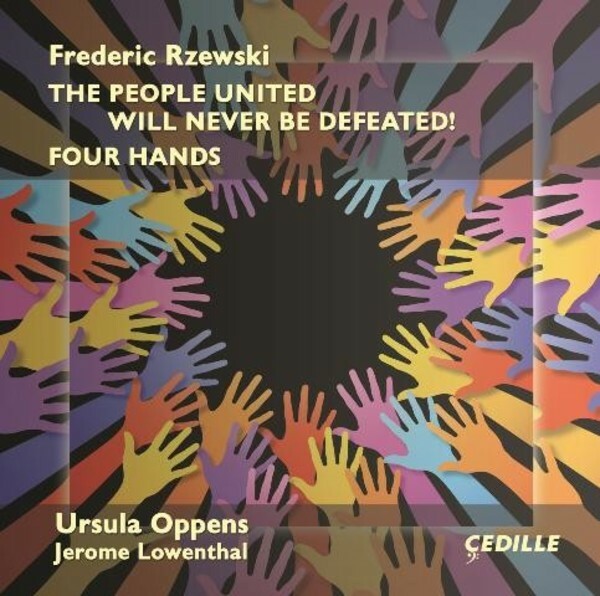 Oppens� world-premiere recording of The People United Will Never Be Defeated! was released in 1978 by Vanguard on analog LP and later reissued on CD. This new recording offers the advantages of Cedille�s 21st-century audiophile production values and an interpretation that benefits from Oppens�s four-decade association with the work. Another bonus is the world-premiere recording of a new Rzewski work, Four Hands, a duet commissioned by and written for Oppens and pianist Jerome Lowenthal, her duet partner on the recording. Fiercely challenging to perform, it leaves the listener �absorbed and exhilarated� (New York Times).